Dollys Gallery. 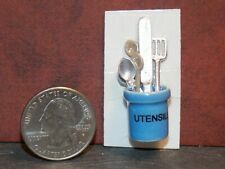 Dollhouse Miniature Kitchen Tool Crock Caddy. Crock is Blue. Crock is made of ceramic. This is from miniature artisan Sir Tom Thumb. 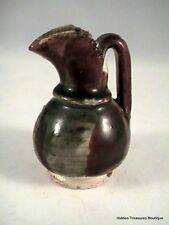 This is a veryBeautiful Grey/Brown Multi-colored Clay Miniature Dollhouse Pitcher/Vase. This vase is handmade and handpainted and is a great piece for your dollhouse collection! This vase is in very good condition. Miniature Colonial?. Porringer Fireplace Pot Pan. Perfect for a fairy tale scene! The bottom is signed "No Lead" pewter. The handle is a little delicate. Dollys Gallery. 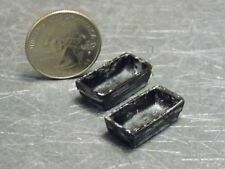 Dollhouse Miniature Kitchen Loaf Pan Set. Dollys Gallery. 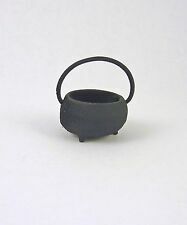 Dollhouse Miniature Kitchen Cooking Pot. This is a great three piece set of vintage handmade artisan copper beer stein with pouring pitcher. In great condition rare beer stein and pitcher. Please review photos for condition and measurements. Thank you and good luck. Eat Play DIY Mini Cup Set With Different Size And Pattern, Fit All You Needs. Type: Eat Play DIY Mini Cup. 17 Eat Play DIY Mini Cup Only. Food Parties Develop Crucial Social Skills Like Serving Others, Taking Turns, And Sharing. Cobalt Blue & White Splatter. Dollhouse Miniature Coffee Pot in. Another Museum Miniature by. Blue & White Spatter Graniteware. One Hanging Dutch Oven w/ Lid. An Excellent Set of Dollhouse Miniature. Coffee Pot & Four Mugs. Another Museum Miniature. in the Handle & a Chip in the Cup. One Casserole with Lid. It does not have any markings but this is the history as found. The bottom is signed "No Lead" pewter. Miniature Colonial Style Dining Plate. 1:12 scale Dollhouse Miniature. 17 piece Rose Porcelain Dinnerware Set. Great dishes to add to your favorite Dollhouse China Cabinet. THIS PRODUCT MUST GO THROUGH THE. AGAIN, I DO NOT COMBINE ON LARGE PORCELAIN DOLLS. Copper Jello Mold. The inside of the mold is silver and it is a nice weight for hanging. 1:12 Scale Dollhouse Miniature. 5/8" Wide x 15/16" Tall Including the Hanging Ring. Copper Jello Mold with Heart Pattern. The inside of the mold is silver and it is a nice weight for hanging. 1:12 Scale Dollhouse Miniature. 5/8" Wide x 15/16" Tall Including the Hanging Ring. 1:12 Scale Adult Dollhouse Miniature. This is an Adult Collectible Dollhouse Miniature and is not intended for Children. Feel free to request a photo of any item for clarification. Handcrafted Pennsylvania Coffee P ot. From Karen's Miniatures this 1:12 Scale dollhouse miniature bowl is made of ceramic and glazed a neutral white. A nice display piece for the cupboard, hutch or a baking scene. 1:12 Scale Dollhouse Miniature. (This dollhouse miniature porcelain Cat Bowl Set has been handcrafted by Barb Schuckman of by Barb. A great set for any favorite feline! Porcelain Cat Food & Water Bowls on Mat. never in your favor). Add a bit of subtle color to the dollhouse table with this miniature Dinner Set from Barbara Schuckman of Miniatures by Barb. The set includes four 1" Wide Square Green Dinner Plates with matching 3/8" Tall Mugs, four 3/4" Wide White Salad Plates, coordinating Placemats and Ringed Napkins. This is By Barb. Add a touch of elegance to your dishes in the dollhouse. 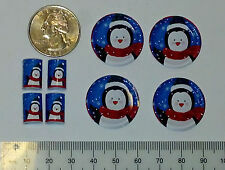 They are 1/2" tall in 1:12 scale.